Insight performed remedial closure and creek restoration activities at a sulfur mine to 1) isolate mine tailings, 2) reduce acid mine drainage (AMD), and 3) restore a creek. Insight was the environmental construction contractor. Mine Tailings Isolation/AMD Reduction – Insight increased slope stability to prevent further erosion of mine tailings, encapsulated mine tailings to mitigate AMD, removed tailings deposits from a creek channel, consolidated all tailings beneath a 60-mil geomembrane cap and placed 12-inches of topsoil that was hydroseeded with vegetative cover. Creek Restoration – Insight restored a creek channel to accommodate a 100-year flood event, constructed drop structures (steps, step pools, and cascade features) within the restored channel, reinforced soil slopes (RSS) along the restored channel, installed subsurface drainage systems beneath the cover and behind the RSS to route subsurface flows into the channel, and diverted storm water runoff into the creek channel. 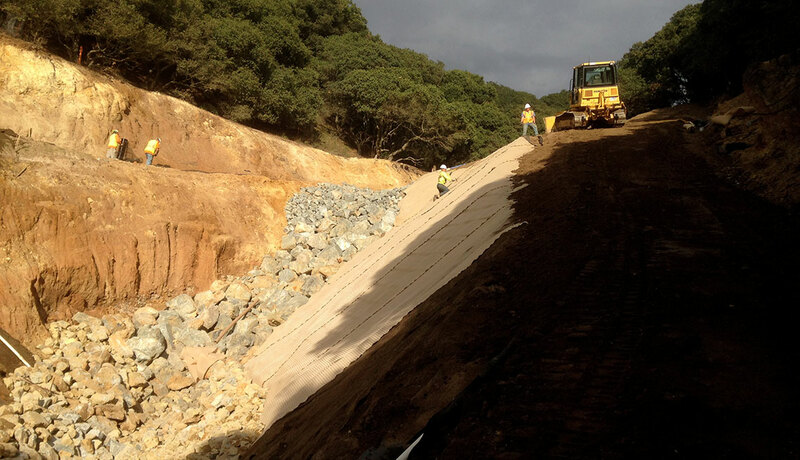 Erosion and Sediment Control – implemented stormwater BMPs – straw waddles, silt fencing, and geotextile fabrics. 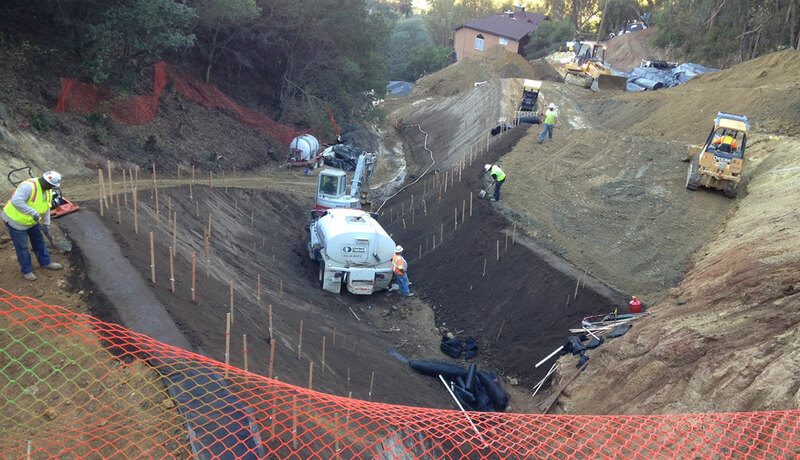 Temporary Diversion of Creek – performed excavation of a spring, and performed temporary diversion of Leona Creek during construction. Mine Adit Closure – controlled seep drain, excavated and closed air shafts and mine adits by backfilling with large boulders and compactable material. Mine Tailings Isolation – Excavated and stockpiled over 10,000 CY of mine tailings, replaced and compacted the tailings in 1-foot lifts, installed subsurface drainage, and installed 1.9 acres of geomembrane. 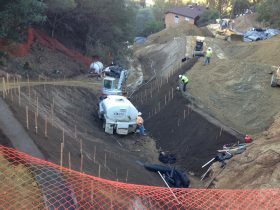 Reinforced Slope Stabilization – Installed a HDPE geogrid in 1-foot lifts to stabilize final slopes of 1:1 and 1:2 (H:V). 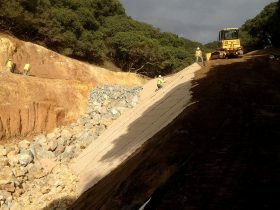 Creek Channel Restoration – Excavated mine tailings from the creek channel, installed channel filter fabric and constructed drop/cascade structures, and imported and placed 2,000 tons of boulders and riprap in the creek bed to manage a 100-year flood event. Site Restoration – Imported, placed, and compacted 4, 000 tons of soil vegetative cover layer, hydro-seeded the cover with native grasses and repaved 4,900 SF of asphalt roadway.